Political immigration continues in the AP. so far YSR Congress leaders continues to emigrate to the Telugu Desam Party,Now there are migrating from Telugu Desam to YSRCP.Recently, the leaders of the TDP have joined the YCP during the Jagan Pradhan in Guntur and Vijayawada. The party rode up with Jagan and they were brought to the VCP. There is another leader in this order that YSRS pipi seems to be shattered.He is no one else ... former minister Anam Ramanarayana Reddy. Ramanarayana Reddy had joined the Telugu Desam Party along with his brother Vivekananda Reddy after the last election. 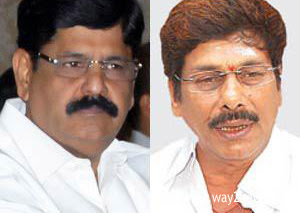 They were informed that the MLC had assured them that TDP had been offered. But that does not happen. At one stage, Ramanarayana Reddy was also offered the post of Chandrababu Minister. But it did not happen. Now, the rumors that Ramanarayana Reddy is in the YSR Congress party is coming to this background. YSRCP believes that discussions with YSR Congress party chiefs are likely to be competing against Ramanarayana Reddy from Venkatagiri Assembly segment. When TDP chief Chandrababu went to visit Vivekananda Reddy recently, Ramanarayana Reddy had gone from there and he had also removed Chandrababu's photographs from his office ... It is a matter of publicity.The party does not change. However, on the Brothers, Mr. Soni Reddy Chandramohan Reddy said ... Anand Ramanarayana Reddy said that he does not think he will join the Vicepip. He said that he will remain in the party and there is no need for suspicion. On the other hand, Anu Vivekananda Reddy has been away from party activities due to ill health. Ana Vivekananda Reddy is suffering from severe illness in Hyderabad.